No, I haven’t been strolling through the park, nor did the month of May start so merrily. As many of you know by now, we buried my 100-year-old mother-in-law on the 2nd of May. My two oldest sons were able to arrange to be let off their boats in order to serve as pallbearers for their grandmother. I’m sure they will carry to their own graves the memory of wheeling the cloth-draped casket out of the chapel, down the sloped driveway, and along the sidewalk the 50 yards or so to the mausoleum behind the church. It touched my heart that they were willing to do so. I have to tell you a little story that happened a couple days after the funeral. I was working away at my desk, when I heard a truck pull up. I went out on the porch, and it was two Mexican men. One of them pointed to my 30-foot tall bamboo and asked, “For 6, how much?” I didn’t really want to charge him but was curious to know what he would use them for so I asked him what he wanted them for. With this limited English, he didn’t understand what I was asking him. He just kept repeating, “Six-how much?”. I told him to just take them, which he evidently understood!! Much later that evening, he came back by with a fresh sack of oysters. Well, that’s what I call a good trade! Because oyster fishermen mark their oyster bed boundary with PVC pipe, I’m assuming they used the tall bamboo poles for that purpose. Heck, why go to the big box hardware and buy PVC when they can come get more here any time? As long as we get oysters in trade, they can take all they want! Just another cool thing about living down the bayou . . . . .
My oldest son’s birthday was the day after his grandmother’s funeral, but he wasn’t too keen on celebrating. No matter, because he and a group of his buddies had a big crawfish boil cook off planned the following weekend, to which he invited me. Well, I wasn’t sure how that would go–all those young adults and this old gal, so I invited my friend KK to go with me. She’s always tons of fun and never meets a stranger. Furthermore, the big bash was held out at a camp east of here on Lake Fields, to which Kay nor I had ever been. The camp is accessible by water only, so my son and his friends took turns ferrying people from the landing out to the camp. It was a gorgeous place and a gorgeous day. And yes, we were the oldest women there, but we had a great time anyway and never felt out of place. Kay commented multiple times how nice those young adults were to us. My son and three of his friends participated in the crawfish boiling contest. They each had their very own distinctive style and flavors, (as shown above), which were ALL very good, too. All of the guests tasted all four entries and then cast their votes. I have to say that choosing a favorite was very difficult to do. (My oldest son won the competition last time, but not this year!) The winner very proudly received a nice, engraved, stainless steel crawfish boiling paddle. Congratulations, Dustin! Back to the home front. Business is slow, both the tour business and the camp rental business. By now, those of you who’ve been following this blog for a while may be wondering how the Beyond the Bayou Excursions are coming along. Well, they’re not. Not to be discouraged, because I know as well as anyone that everything happens for a reason. What with my little health scare in March, I’ve come away from it knowing that fretting over things I can’t control can kill me, and I just don’t have time to die right now. Truly! I’ve so much left to do in this life. I’ve been trying to spend more time out on the water like I used to when The Captain was still running big boats, and I didn’t have to bring home the bacon. Granted, spare time is at a premium, and it’s not the same as when Termite (my youngest son) accompanied me, but being out on the water, away from the cares of this world, does refresh my spirit. As I go slowly along in my boat, I keep my eyes peeled for any form of movement in the water, along the banks, and in the trees on the chance that I might see something worth photographing to share with you. On one particular day, the wildflowers and alligators caught my eyes more than anything. The state wildflower, these Iris grow wild in this particular marsh. I’ve read that their shape inspired the symbol of Fleur-de-lis, so I assume they must also grow in France! Their bloom time in the marsh is very brief, so it’s crucial to get out there at just the right time. I found them close to the end of their blooming season, but the colors were still very striking, which I never grow tired of seeing. 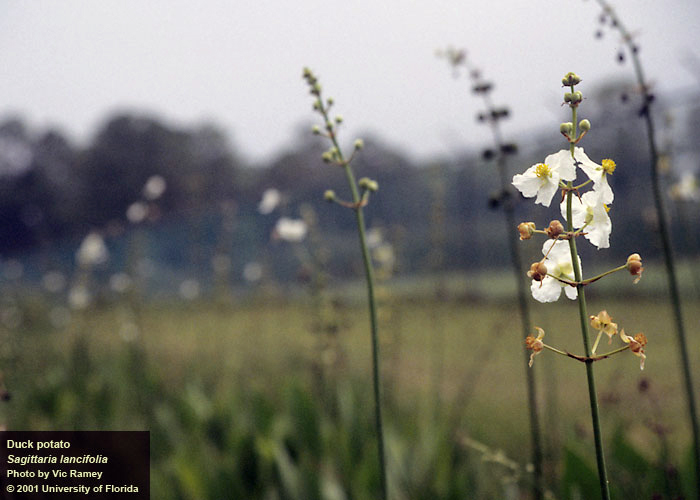 These white flowers, Sagittaria Lancifolia, a member of the Water Plantain family, grow thick across this marsh. Although not particularly a beautiful flower on its own, a field of them produces a rather striking view, with their white heads bobbing amidst the varying shades of vibrant greens. Upon closer inspection, I found that the interior of the flowers (pistils) attract little bugs like this odd-looking orange-ish Lady Bug. On my most recent trip, I heard the growling of several bull gators in the marsh nearby, which explains why none of them swam over to inspect my boat as I anchored in “Garfish Pond”. They’re too busy attracting their mates to hang out with me. I tried to record the growls for you, but my timing was way off. I’m sorry I wasn’t able to capture the guttural power of these creatures for you, as there is not another sound like it that I’ve heard. Nonetheless, this little guy, not yet old enough for the mating season, was willing to hang out with me. Once I realized the bird was leading me, I turned off the motor and drifted, grabbing my camera in hopes of getting a good photo so that I could ID the bird once I returned home. The bird then flew across in front of my boat to the opposite bank, giving me another great view of its markings. And then, out of nowhere, came its partner. It took some doing as they played chase, crossing the bank from right to left in front of me each time I got close enough to get a good photo, but I finally got one, although not nearly close enough to do this beautiful bird justice. Meet the first ever Yellow Billed Cuckoo I’ve ever seen out in my marsh. I’ve seen them over in the oak chenier on Grand Isle during migration, but migration is over. They flew off into the thickness of the trees, out of range, but I think this pair is here to stay; well, at least I hope they will stay. Satisfied that I had at least one semi-good photo of the cuckoo, I cranked the engine to head back in. I didn’t make it far before another flash of wings caught my eye. This bird was busy finding its lunch in a willow tree, and I recognized it right away; although I’ve never seen so fine a specimen this close up before. This Eastern Kingbird was not the least bit disturbed by my floating presence beneath its willow-tree smorgasbord. I motored the rest of the way out enjoying the sweet scent of the blooms on the otherwise annoying Chinese Tallow tree. I say annoying because they are non-native, invasive trees that are slowly choking out our native ones. In spite of that fact, they are salt-resistant and hardy, and their roots are holding in place what sediment we have left along these bayou banks. It’s beneficial to see the good in the bad, sometimes. See how I was able to do that? Lastly, I continue to write a little outdoor column for a local paper twice a month, which really keeps me on my toes in terms of finding interesting and appropriate material and meeting deadlines—something of a challenge for a free-spirited blogger like me. The downside of writing for a newspaper is that it takes away from my time to write creatively here for you, my dear readers. So, please understand that it’s not that you’re not important to me; but I do have to bring home some bacon, and freelance writing is something I can do from home while tending to my home-bound responsibilities. I hope you’re having a very merry month of May. If so, will you please share your merriment with the rest of us in the comment section below? Love the photos. I had some of those Iris in the early ’90s and I ended up giving them to my elderly neighbor. She isn’t with us anymore and the woman who bought the house a few years ago, is not an outside person at all. Never have seen her outside for anything other then going to the garage and once to give some instructions to contractors. I figured the LA Iris died but, I saw it this weekend all bloomed out in among all the weeds. Those are hardy plants! I had transplanted some to my front ditch years ago, and then the state came along dredging out the ditches, making them deeper for drainage and scooped out all my irises and hauled them off. I wasn’t home when it happened, so image my shock and anger when I did get home and discover my beautiful flowers all gone! The wild iris has always been my favorite. Even when I was a little girl playing in my Grandmother’s yard, I remember her flower bed full of irises of all types. They’ve been my favorite ever since. Oh, and because of her and my father, I am partial to roses, too. Hope you’re having a nice spring. Had your crawfish yet? Wet spring here. Hardly any plums at all. I found 2 good ones. Only about 3 branches actually have plums on them. I have been picking dewberries at moms. Small but very good. Our crawfish boil was canceled after we lost a family member. Even my husbands company picnic was canceled due to bad weather. Hopefully, on the 4th of June, we will be able to have our fill. I know what it is to love the iris. I picked some at my aunts old falling in homestead and hubby went out to the country to his mom and dads first place to dig some up. Where their house had been was a big patch from those his mom had planted originally. I have them around our flag pole out front. I never leave a comment but I wanted you to know I’m sorry for the loss of your grandmother. I love reading about your adventures. Beautiful photos! Wished I had been with you to see the cuckoos! Me too!!! So great seeing you this trip! I always enjoy “being on the ride” with you. It is reminiscent of an earlier time when my boys were younger and their friends were welcome to accompany us on weekend family fishing trips. Thanks for sharing the pretty photos and I did have irises this year. Your mother-in-law left a wonderful legacy, one which will most likely inspire more of your writing. I look forward to that. As you are in mine. Hope all is well in Canada! It’s so good to hear from you again, too, Bill! Glad you enjoyed the story and photos! Hope all is well in your world. Love you, your family and your blog! I miss me some of my north La. friends . . . . when ya coming back down? Shrimp season coming soon . . . .
Love the Bamboo story…the days o’ trade are returning! I’d say Bamboo for fresh Oysters is a great way to start a friendship – or at least a business relationship. Well, I can NOW; or maybe Mr. Google could have done the work for me, aye? I wish I had some bamboo! All I have are weeds around here. I could go for some fried oysters. As always, I enjoy reading your blog and articles which are published in Country Roads. Well, all it takes is about a 12-inch piece of bamboo to get the party started, LOL!! Oh, and about 10 years to grow 30 feet tall! Thank you for being such a faithful reader, Steffi!